We are portraying a number of dogs for Teaming. One we could not possibly ignore is Spirit. We have asked a number of former and present Camp GaGa volunteers to share their thoughts about Spirit. Spirit was found in the streets of Mytilini, the capital of Lesvos. At the time, he was terrified and starved. He has been in our shelter for about a year now, and he is 4 years old. Miranda (volunteer in the past year): His name also means ghost or soul, which typifies him through and through. Spirit’s soul speaks to you very directly. His large almost cat-like eyes are a direct reflection of his soul. He is a very respected dog in Camp GaGa to boot. He is kind and sensitive, and he can be a real cuddle bunny if he trusts you. Also, he is still a pup inside. Nothing beats running and fooling around, catching butterflies, and dozing off in the hole he dug. His long floppy ears and characteristic face make Spirit very special to me. Beppie (permanent volunteer): I remember to this day how you entered the camp – a skinny, scary pointer, feeling too miserable to do anything. I spent many hours sitting beside you, and you showed me a little bit more of yourself each day. I was keen to help you, and I took you out into the big world. You were so scared. Our first walk outside was very short, and one day you jumped of fear when you saw a man approach in the distance. You were all in flight modus, but we sat together and waited for that creepy man to pass by. From then on, something had changed. That look in your eyes just radiated peace and confidence. We went out more frequently, and you would return to Camp GaGa really proud of yourself. Dear Spirit, I hope your big day will come and someone will recognize your wise soul and come for you. Ellen en Bruno (volunteers in the past year): Spirit is our crazy, beloved Greek friend. He was not too fond of us when we first met, but curiosity soon took over, and he came to see us more often. We celebrated every time his kind face appeared around the corner. Bruno and Spirit have had to work on their relationship, because Spirit was very afraid of men. Their mutual trust grew little by little, and we have had so much fun with the three of us. Bruno and Spirit would cuddle together, and we would make wonderful walks and play with balls and ropes. Spirit is simply the best, a real darling who chases butterflies! (on the photo Bruno with Spirit). Fiona (volunteer): Confidence is a very important issue for Spirit. I could not approach him when I started out as a volunteer. But Spirit came a little closer every day, and after a few days he came to me for a cuddle! That was such a great moment. Now that he has grown accustomed to me being around, he often comes up to me for a pat on the head and a cuddle. Spirit is a quiet dog, who is often just asleep somewhere in a corner or quietly lies and looks around at everything that is going on. He is a real darling, who needs a little time to build trust. Tessa (volunteer in the past year): when I first met you, you were so very fragile and frightened. You have been through too much, which has made you anxious. It was love at first sight when I saw your beautiful eyes and friendly face. In subsequent weeks, you slowly started to thrive in the loving surroundings of Camp GaGa. We have witnessed your transformation from a scared and traumatized skinny fellow into the beautiful and playful dog that you are now. Once you felt safer, you took the initiative of making new frightened dogs feel at home. I’m so impressed with how you have grown, and I feel proud about how far you have come. You deserve the very best, because you are beautiful, from the outside as well as from the inside! Our shelter also has a place for traumatized dogs like Spirit. Often, they have a long road ahead of them before they are ready to be rehomed. We work with them to help them grow and offer them a future. 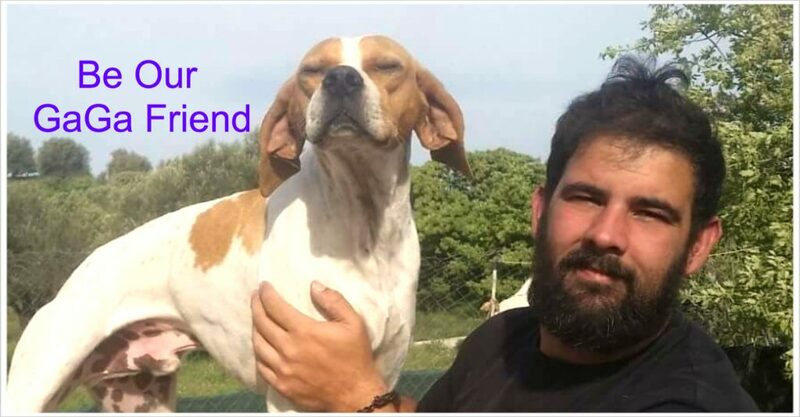 Help us help dogs like Spirit by donating 1 euro a month (no more and no less!) and becoming a Teamer. If more Teamers join us, we can help more dogs. Why not join us? Go to TEAMING and click on the “Join this group” button. Be sure to have your international bank account number (IBAN) at hand, and create your log-in details, quickly and free of charge. Do you need help or have any questions? Just leave a message or contact us.